I often forget about the warmth of summer until I’m halfway through a wool sweater and wondering why the yarn insists on sticking to my fingers; invariably I’ll turn to cool cotton or silk blends to give myself a brief respite from the sticky mess of my wool project. I love knitting sweaters, so summer knit tops are the perfect solution to my problem. Knit tops have the same general structure of sweaters, but you get to skip the sleeves! This collection of free knitting patterns is the perfect staple for the knitter who doesn’t know what to do with herself when the weather turns warm. Sit back and get started on one of these excellent patterns for summer, you'll have a blast. We often think of the stifling moments of heat in the summer, forgetting that the nights and mornings can often be quite chilly. We’ve included a couple of light knit sweater patterns in this collection for those moments when the summer weather isn’t ideal. Knitting Free Patterns for Summer: 7 Sizzling Knit Tops, Knit Sweater Patterns & More has all of your summer knitting needs covered. From knit tops for warm days to sweater and shawls for the cool nights, this pattern collection has your needs covered. Download your free copy of Knitting Free Patterns for Summer: 7 Sizzling Knit Tops, Knit Sweater Patterns & More today! Knit tops are a fun way to incorporate your knitting into your everyday life. These free knitting patterns are light enough to wear during the warm months of summer, but can always be layered for a warmer outfit when the weather gets cold. You’ll be sure to draw lots of compliments when you don one of these stylish summer knit tops. Making your own garments is a great way to reclaim control over where your clothes, or at least some of them, are coming from. These knitting patterns for summer will help you beat the heat and look great while you do it. Knit tops don’t have to be close fitted affairs; patterns like the Rosy Cotton Top (p. 11) are loose fitting, allowing air to flow through the garment. Patterns like the Casual Knit Top (p. 4) will make your summer look a real hit. Summer is just around the corner, so the spring is the perfect time to get started on your next big wardrobe addition. With the help of these free knitting patterns, you'll be ready to meet summer with a cute new top in your wardrobe. Knitting is often thought of as a winter craft, perhaps because of the insulating powers of wool. However, you can wear your knitting in the summer without sweltering; all you need are some cute, light patterns to start you on your way and a good cotton or silk yarn. 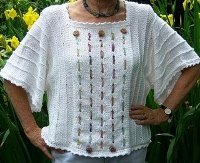 Knit tops are a great way to show off your knitting in the summer months, and are very rewarding projects to create. With the help of these stellar free knitting patterns you’ll be able to knit throughout the summer months to create some gorgeous projects that will be the envy of your family and friends. Sometimes even the summer calls for a cute sweater; whether it’s rainy or just a little cooler than usual, having a knit sweater on hand to throw over your shoulders is an incredibly satisfying feeling. Of course, no matter how chilled you feel, wool probably isn’t the thing you’ll be wanting in the middle of July. We’ve added a couple of light knit sweater patterns to this collection to round out your selection of summer knitting options. Having a reliable summer sweater is something you’ll come to love. The Emily Sweater has short sleeves, making it a great addition to any warm weather outfit. It will warm you without overwhelming. Working on a long-term project like a knit top or knit sweater pattern is a great way to help the time go by during road trips. Sweaters are actually often a little more mindless than people realize—all those rows in the body of the sweater won’t knit themselves—so they’re great summer projects for outdoor knitting or working on while watching a child’s baseball game. That’s right, we have plenty of extra patterns for summer for you to try out! From knit shawl patterns to the Basic Summer Poncho (p. 7), these patterns will round out your summer wardrobe. Like the summer sweater, these free knitting patterns will prove handy for those moments when you want something light to throw over your shoulders. You can use your poncho or shawl to keep off the rain in a light drizzle, or simply to keep off a chill. These free knitting patterns will also be a rewarding knit, since they’re based off of the basic shape of a triangle. If you're in the market for a relatively mindless knit, these patterns will pretty well fit the bill. 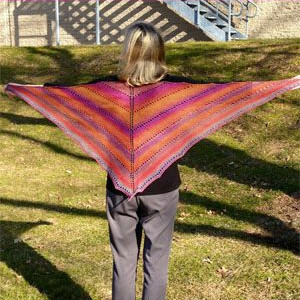 The Desert Lace Shawl (p. 9) follows a simple lace pattern that will have your work looking fantastic without being a complicated challenge. Treat yourself to these fantastic free knitting patterns this summer. You'll love having something simple to keep your fingers busy on car rides, and having a variety of cute knit tops to throw on whenever it strikes your fancy is a very liberating feeling. These great knitting patterns for summer will help keep your fingers in shape, despite the heat. So why wait? Download your copy of Knitting Free Patterns for Summer: 7 Sizzling Knit Tops, Knit Sweater Patterns & More eBook today and jump right into the summer fun! These rewarding patterns will help cement your memories of the summer; with every stitch you make will be a memory of a wonderful summer. Six weekly emails with free knitting patterns, tips, collection pages, videos and more. With our latest eBook, Knitting Free Patterns for Summer: 7 Sizzling Knit Tops, Knit Sweater Patterns & More, you'll find yourself knitting any number of fabulous summer knitting patterns. And once you subscribe to receive our newsletter, Knit Picky Patterns, you'll see how incredibly rewarding it is to be a part of the knitting community! Check out this free eBook and the AllFreeKnitting.com site to draw tons of knitting inspiration! summer tops -- and knit summer tops at that fantastic. I live in Southern Florida, it is hot here even in winter months. I am always looking for summer patterns. Looking forward to trying one of the patterns. I sympathize. We used to live in Boca, and prior to that, Weston, and I loved to knit. Now we have just moved back to Canada, and there is lots of need here for knitted items. I'm just geting back into knitting. I was given 50 to 75 scances of yarn from a friend of my sisters for free. Its been several years since i have knitted so i,m startin all over to re-learn the basics.